Lead poisoning in the Dominican Republic and Peru.Toxic cities like Norilsk, Russia and Ranipet, India. Water contamination at the Zortman Landusky gold and silver mine in north-central Montana, USA. If Saskia Sassen is right, these are not isolated incidents. They are part of a shift, accelerating in the last three decades, from a middle class-oriented capitalist system to an inequality-driven one in which the better off a minority elite gets, the worse off the everyday citizen is — and not just financially. In her latest book, Sassen suggests the new severity of this predatory logic is best observed in mass displacements of average people from their daily life spaces. Underlying the well-known and widening inequality gap is a maze of influential actors, markets, technologies, and governments able to concentrate wealth, resources, and power through new forms of expulsion from jobs, lands, homes, and livelihoods of the global majority. This process of accumulation and expulsion is enabled by global finance and environmental neglect. The malleability of a global financial system, its innovative capacity in the past decades to turn anything into potential moneymakers through rather obscure operations has affected the way we access even the most basic services. At the same time, expanding ecological devastation happens in tandem with foreign land acquisition and resource privatization, with negative effects for local governments and smallholder economies. Even more disheartening, the inner-workings of these novel forms of expulsions are "subterranean": they are made purposely ambiguous and invisible, making it ever more difficult to pinpoint responsibility and accountability. Attempting to bring emerging systemic dangers to our attention, Sassen documents the edges of expulsion and extreme cases of devastation through a series of well-researched case studies. In an almost depressing way, Sassen's book is a ride through the darkest side of today’s capitalism. Sassen begins with the contradictory logic of what may be described as a new phase of advanced capitalism. While in the past three decades corporate assets and profits, along with the wealth of the top 1 per cent, have risen dramatically, their taxes and the average person’s income have significantly decreased. In places where the financial bubble hit particularly hard, soaring unemployment, massive foreclosures, home evictions, and rampant poverty illustrate a bleak post-crisis reality. Take southern Europe as an example. Countries like Greece or Spain, previously considered full-fledged developed economies, have over 50 per cent youth unemployment today and hefty rises to government indebtedness. Greece has nearly tripled its public debt and Spain surpassed 400,000 foreclosures and hundreds of thousands home evictions after receiving an IMF [International Monetary Fund] loan of 100 million dollars meant exclusively for its banking system. The financialization of housing access ignored over-indebtedness and unstable jobs and created an illusion of middle class security, which came tumbling down when highly speculative financial instruments, like "subprime" lending, went bust. Today, with economic decline, cuts to welfare systems particularly in health or education, and growing numbers of forced part-time workers, Europe is turning increasingly into a poor and unequal continent. But Sassen alerts us that processes of exclusion are occurring across the globe. Her other examples of expulsion include for-profit privatized USA prison systems and forcible displacement of millions of people from resource-rich war zones. 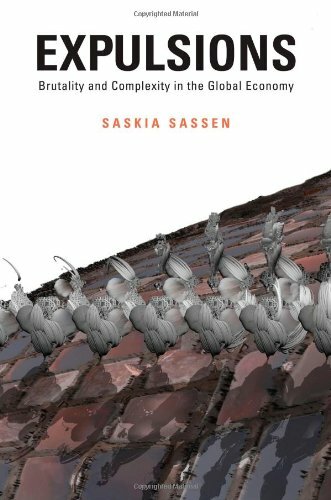 In addition to financial devastation, Sassen examines ecological impacts of the global economy, dismally documenting environmental pollution that has left people displaced, expelled or risking high contamination levels. Citing cases from across the globe, she illustrates how water pollution and conflicts are poisonous outcomes of privatization. All of her ecological cases exemplify resource-extraction industrialization with little waste management control and unregulated use of natural resources resulting in highly toxic areas greatly affecting inhabitants for generations to come. One key example of water contamination locates us at the Zortman Landusky mine in Montana, USA, where a highly successful gold extracting mechanism quickly turned into a high water polluter after at least eight different spills in the 1980s. As a result vast water supplies and wildlife were extinguished or made unusable. As in some of the other eco-disaster examples she provides, financial markets, bankruptcy laws, and corrupted politicians became pivotal in avoiding sanctions or limiting liabilities while increasing firms’ profits. Pegasus Gold, the previous operator of the Montana mine, astutely bankrupted after ecological obligations pilled up, later reconfiguring under a new name to continue profiting from gold extraction. The breadth of Sassen's research is impressive and, underneath a sometimes jargony language, this book acts as a compendium of capitalism’s ravages. The many, varied examples she provides invite us to look beyond localities and focus on what cuts across different forms of economic, ecologic and social expulsions. This book raises a voice of alert while calling for a new set of thinking tools to make sense of our development-obsessed global system. Her expansive research thoroughly recognizes brutal sites of immiseration and effectively transmits a sense of urgency; like melting Arctic glaciers, we are running out of time.